Tags: Vocal recording and mixing techniques. It is a common music production technique in rock music to have vocals distorted. So how are you going to do this nicely in your multi-track mix? This tutorial is using Adobe Audition DAW software and Antares Tube plug-in to accomplish this objective. This is a pretty simple technique that can also be applied with any DAW such as REAPER, etc. This assumes that you already completed tracking the vocals. 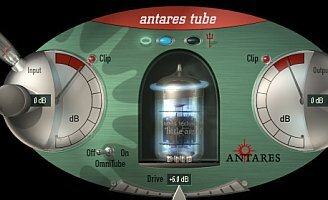 Note: If you are not using Antares Tube plugin, there are lots of similar plugins that you can use. As long as it provides slight distortion (not heavy metal type of distortion), any types of plugin would work even the free ones. Reaper DAW includes so many open source plugins that you can use in your mixing projects. 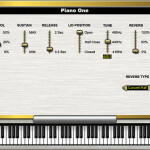 These are the Reaplus VST plugin in REAPER. If you are using that software, try installing those plugins and see how it works. 1.) First, you need to secure the Antares Tube distortion plug-in; you can use either a VST or Direct X type. You can download it here. If you encounter downloading and installation issues, please contact Antares support here. For those that are using REAPER, you can read this tutorial. 3.) Once successfully installed, confirm if the plug-in is working. Launch your software, load up your multi-track session project and then check if you can see Antares Tube as one of the VST/DirectX effects. In Adobe Audition multitrack view, you can see it by right clicking “FX” tab, and then click “Rack Setup”, so you can see it under “Installed Real-time effects. 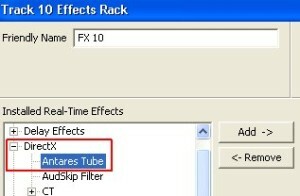 In Reaper, this is also available in its effects/ FX tab. First option: This option is recommended if you are mixing music for pop-rock style where the vocals needs to be distorted very slightly just to get that “scratchy” and “throat” effect while maintaining clarity. To do this, just add the Antares Tube effect as the first effect in your “Effects Rack” (before the vocal compressor or any EQ effects).